Meagan McAdams, journalism student at Southern Connecticut State University, reported this story in 2017 as part of Journalism Capstone coursework on World War I.
Connecticut researchers helped develop one of the greatest contributions to World War I — the ability to detect and track submarines underwater. Researchers at an experimental station in New London developed listening devices that would allow for detection of submarines, based on similar technology in the works in England. As a result, American submarines were the first to be able to track the underwater movements of the enemy. “The United States had no real effective way to find the submarine once it was submerged, so that was the basic problem,” said Roy Manstan, the author of “Cold Warriors,” a book dedicated to how New London tracked submarines during the war. The technology that was developed in New London during World War I, Manstan said, was one of the greatest contributions from any country to help end the war. Once a submarine was completely underwater there was no way of detecting it from above. However, running submarines were still noisy underwater. The devices, essentially large hydrophones, were placed in the water allowing sailors to listen for the noise of the submerged submarine. They could then track its location from miles away and attack. Sailors would be trained in the Long Island Sound with submarines from the Groton submarine base. 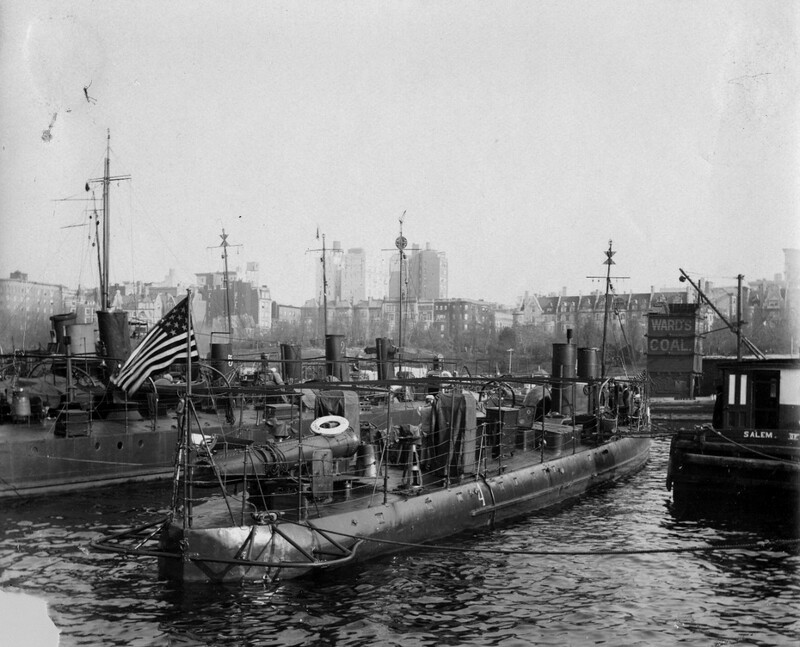 Submarines stationed in New London, Conn. during World War I. Photo from the Naval History and Heritage Command. One of the five scientists who helped develop these devices was Harvey Hayes, head of the physics department at Swarthmore College, who was already experimenting with them. When the U.S. government noticed him, Hayes was called to join the efforts in New London. According to an article in the Oneonta Daily Star in 1917, Hayes was not allowed to disclose any information about where the laboratory was located. “The few times we discussed underwater acoustics, he seemed more interested in having physics discussions about the ocean bottom acoustic reflection studies,” said Hayes’ step-grandson, Bernie Cole. Cole said Hayes was a man of few words and neither he, nor his son, would speak of Hayes’ work much. “Part of that may have been because of the secrecy of the work at the time, but in that era there was also a lot of concern the others might patent another’s work if too many details were divulged,” said Cole. The U.S. government contacted professors also from Harvard, Yale, Cornell and University of Wisconsin, who were brought together in New London to concentrate their efforts on creating anti-submarine devices. The goal of the listeners during the war was to train sailors to hear the submarines, and be able to chase them. When the sailors were prepared, they would be sent across the ocean to hunt German submarines. “No one really had much faith that a submarine had any effective use. A naval vessel, it was a curiosity. It was considered something that would be used as maybe something to defend a harbor or something but not to go out to sea and look for a specific target,” said Manstan. Germany’s plan to win the war by using submarines was hindered when American sailors could now track them. When the submarines were located, depth charges were released where the enemy submarine was presumed to be. These were essentially large canisters filled with gunpowder that would drop to a depth that they thought the submarine was, and then explode, hopefully damaging or sinking the target. This anti-submarine warfare changed how the war was conducted. In the 19th century there were only a few experimental submarines, and after America entered the war, the need to produce modern submarines expanded rapidly.